WALT KIRBY hunted with us in early February and was pleased to get this beautiful tom on the third day of his hunt. 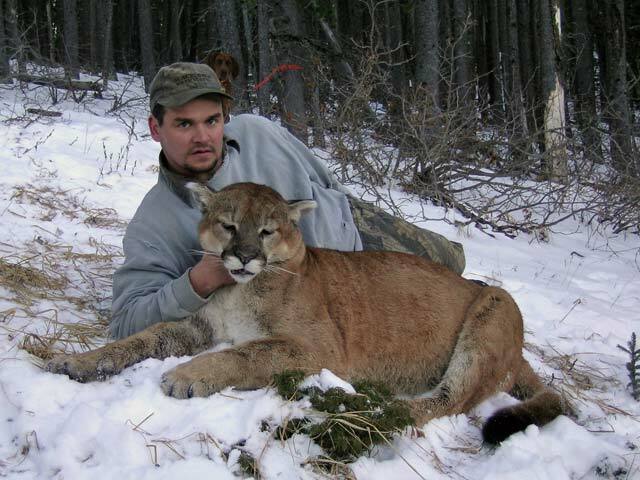 JIM LAWRENCE of Goodrich, MI, came to Alberta to get in on his first cougar hunt. He had some bad luck on his initial hunt. He made his second try of the season in early February and his persistence was rewarded with this exceptional cat. JIM McDOWELL of Howell, MI, like his partner above and also came back again in February, we caught up with this great 176 lb tom a few days later. Outfitters don't always get as many chances to hunt as they would like. This year Gordon was happy to take this beautiful blonde bear on the last day of the spring season with a 140 grain Barnes X bullet from his .280 Remington. CHRIS SPEAKMAN, is a taxidermist in Chillicothe, OH. 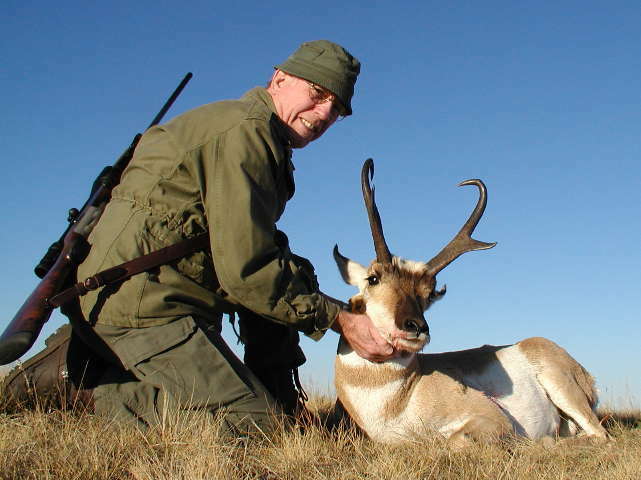 He came to Alberta in search of a "respectable representative" of the pronghorn species to mount full-size. He was rewarded with this heavy, long pronged buck! 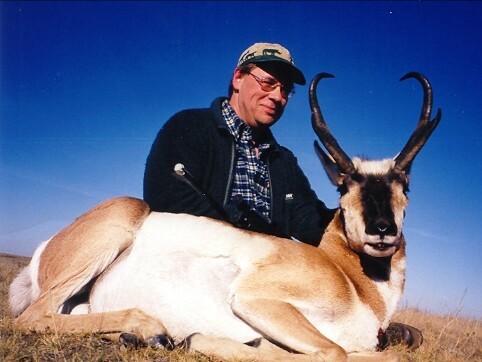 JURGEN KOCH and WERNER MOSER came all the way from Germany to harvest these two nice antelope. JOHN KERRIDGE of Pahiatua, New Zealand, took this Shiras bull moose on the second day of his hunt. 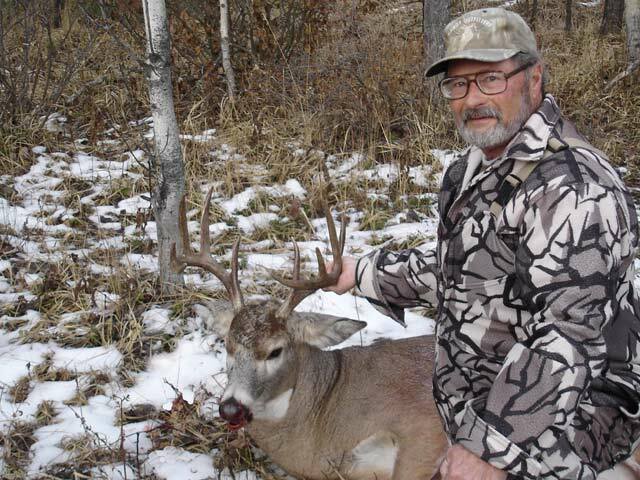 John was also lucky enough to put his tag on this nice mountain mule deer buck a couple of days later. He took both animals using a .280 Remington with 140 grain Barnes X bullets. TIM and SUSAN FALLON of Barksville, TX, joined us in October. We connected at the Safari Club International Convention a couple years ago and made plans to hunt together. It's twice the fun when we guide a husband and wife and this hunt was no exception! We started out on the prairies getting an antelope for Tim in the first few days. The girls hunted long and hard before Susan connected on this heavy horned buck. We finished up their hunt with a trip to the mountains and a Alberta Shiras moose for Tim. 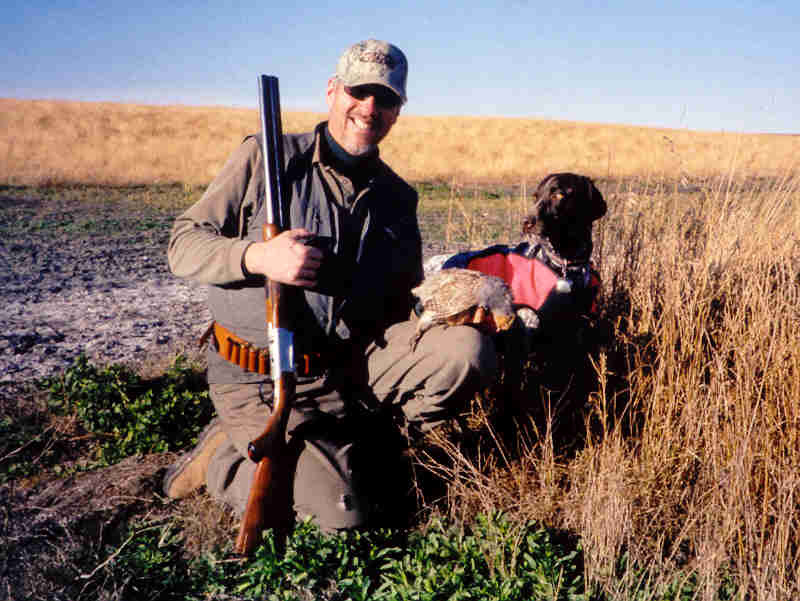 We also found time for a little wingshooting over "Buster", the German Shorthair Pointer pup we brought home with us from the NE Michigan SCI fundraiser last April. DAVID ARTHUR of St. Charles, MO, made a great shot on the first morning of his hunt to get himself this terrific 5 X 5 muley. 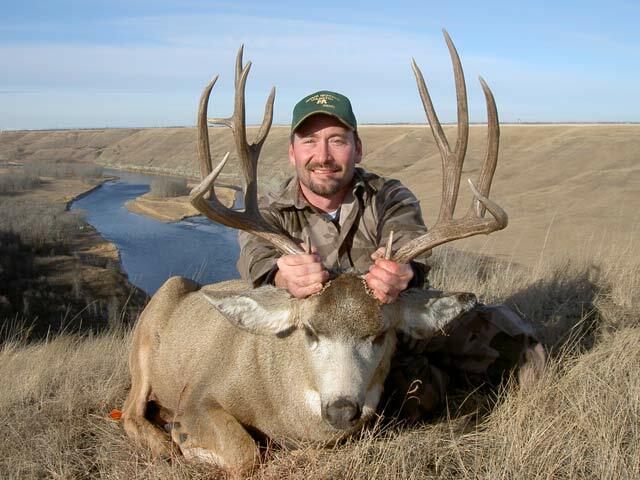 ROSS JACKSON of Golden, CO, hiked a few hills and coulees before he scored on this nice muley buck. He's looking forward to coming back to find the "one that got away"! CLAYTON SMITH of Reno, NV, knew he had reason to celebrate when he took this long-tined "classic" 4X4 in a prairie coulee. This is one of three big muleys going to our Nevada hunters this season! Clay also tagged his first whitetail buck earlier in the week. GARY FURMAN of Reno, NV took this whitetailed deer a half hour into the first morning of his hunt. He was also fortunate enough to connect on this fine prairie mule deer before the week was done. RICK FURMAN of Reno, NV was not about to be outdone by his dad Gary (above), and took this great long tined buck on the last day of his hunt. 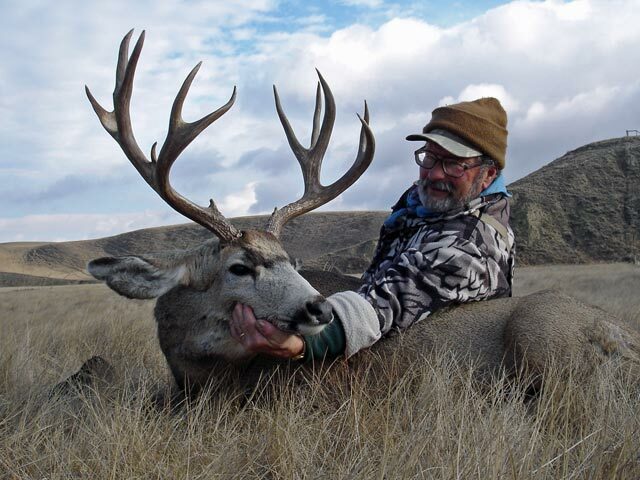 This year Gordon was exceptionally lucky, in addition to the nice bear taken in the spring, he also took this magnificent non-typical muley. With 10 points per side this is truly a dream buck for him. As always, he was using his .280 Remington with a 140 grain Barnes X bullet. 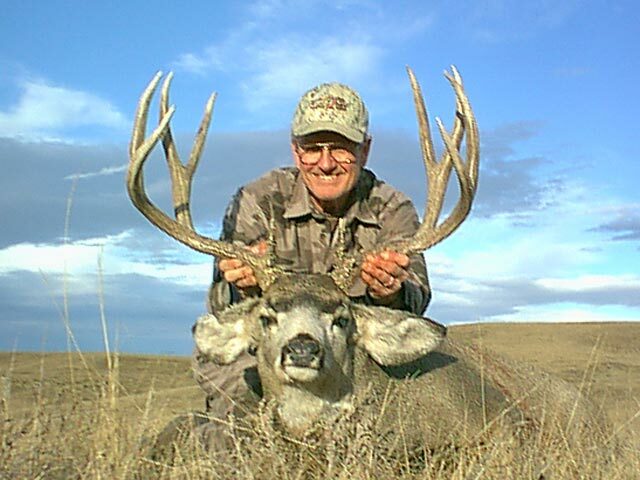 WAYNE SMITH of Graham, WA was hoping for a chance at a nice prairie mule deer buck. We were happy to see him have the opportunity to take this beauty. ROD MOENCH of Hanna, AB was with us in December. We covered a lot of ground before catching up with this nice Tom. Thanks to everyone who joined us in 2004 and made the year such a memorable one for us. We truly enjoyed sharing your success with you! Dale Silbernagel, Danny Fieldberg, Darren Daniel, Gary Villemaire, Glen Eldridge, Heide Bowyer, John Gordon, and last but not least... Kim, Toni and Don Grayson.